I love trying new brands and products and always get excited when new products arrive for me to try, so when a couple of products from the brand Hempz arrived, I couldn't wait to give them a whirl. The products I received were the Hempz Coconut Fusion Shimmering Herbal Body Souffle and the Hempz Herbal Lip Balm. Hempz beauty products are enriched with 100% pure natural Hemp Seed Oil and Pure Herbal Extracts. Hemp is one of the best sources of Essential Fatty Acids and has a perfect 3:1 ratio, Hemp Seeds are rich in Vitamins E, C, B1, B2, B3, B6, and also Iron, Zinc, Potassium and Carotene. 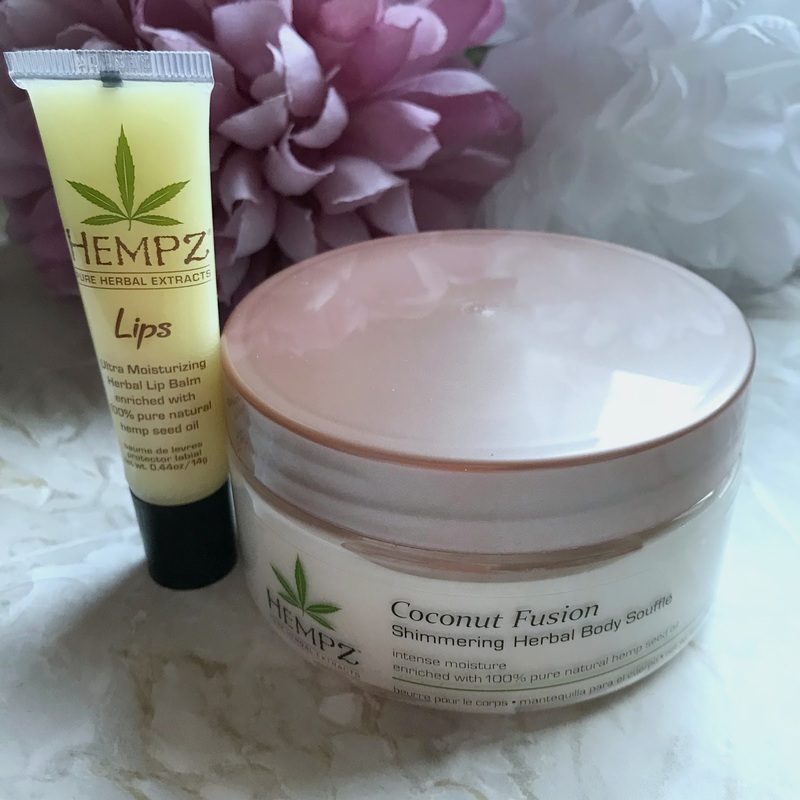 The Hempz Coconut Fusion Shimmering Herbal Body Soufflé is an intense body moisturiser which is whipped into a rich, light, luxurious soufflé for fast absorbency, it is enriched with 100% pure natural hemp seed oil. 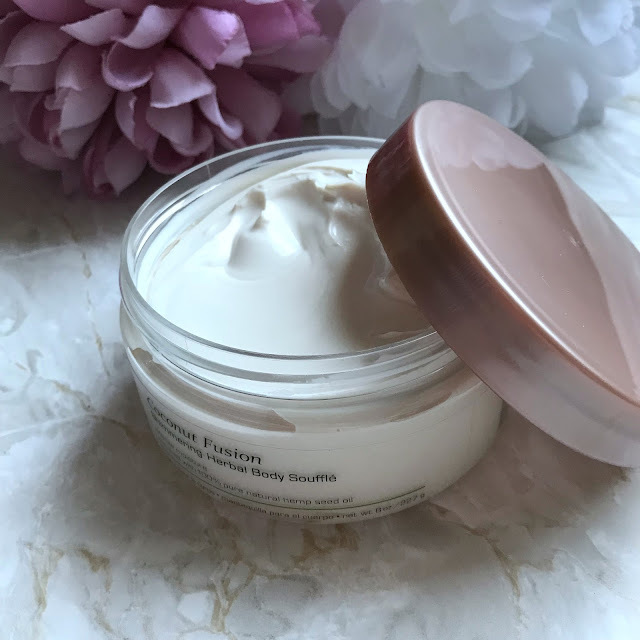 The souffl contains citrus fruit complex and a touch of shimmer which are blended in to moisturise, condition and revive the skin, leaving it soft, smooth, hydrated and glowing. 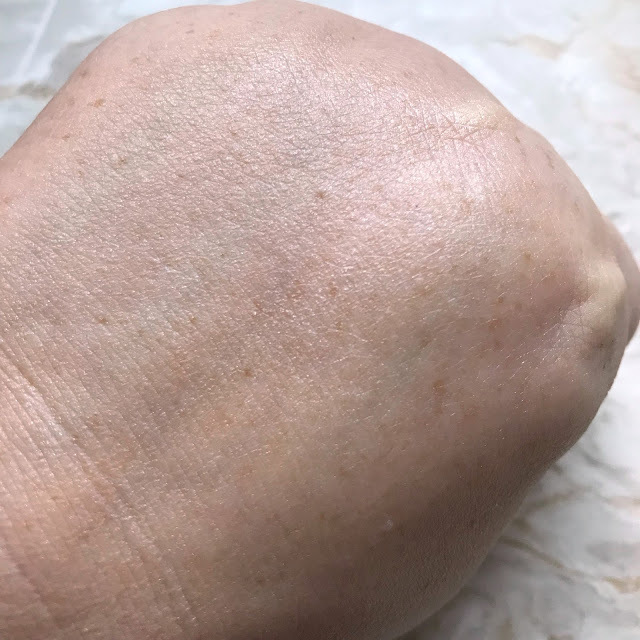 The soufflé feels lovely and very luxurious it has a lovely texture and does feel whipped, I haven't tried anything like it before, it feels lovely and sinks into the skin perfectly and best of all it doesn't take an age to dry which is brilliant and it smells absolutely incredible. My skin is left feeling lovely and soft and hydrated and not oily at all, it leaves a subtle glow to the skin as you can hopefully see from the photograph above, it would be amazing to take on holiday for an evening and I can only imagine my skin would feel lovely using it after a day in the sun. The body soufflé is paraben free, gluten free, THC free and 100% vegan. 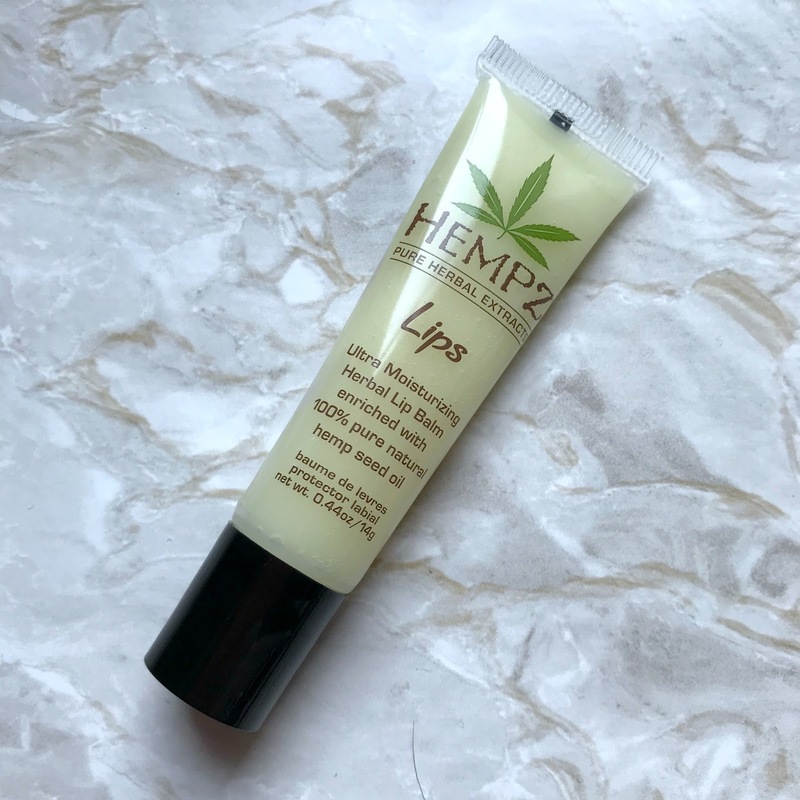 The Hempz Herbal Lip Balm helps to condition the lips, providing hydration, nourishment and conditioning to the lips. The lip balm is quite thick in texture but not too thick and it feels extremely hydrating on the lips. 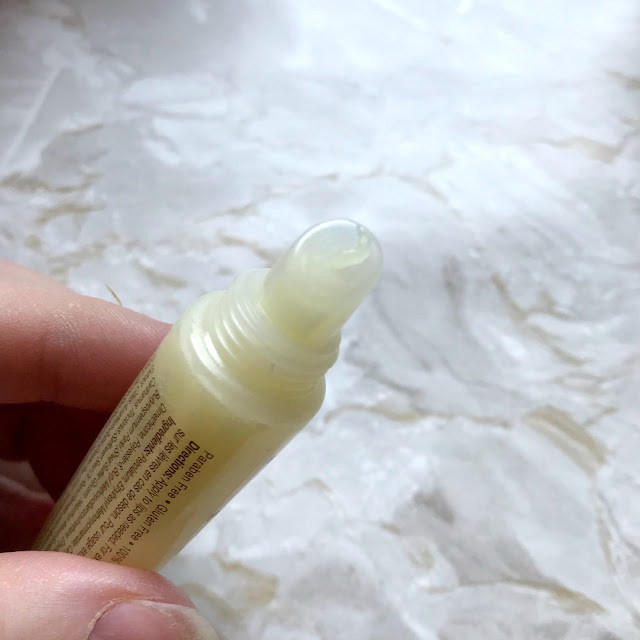 I don't suffer with dry lips, but I did use the lip balm for the purpose of the review and then passed it on to my youngest daughter, who incidentally had very sore and dry lips. The lip balm leaves my lips feeling incredibly moisturised and the first time I tried it, I was surprised at how long the balm lasted on my lips and how long my lips felt soft for. My daughter had very dry and sore lips so I passed the balm onto her and she loves it, the tiniest amount is needed meaning the tube will last well. My daughter said that when she applied the balm for the first time, her lips felt soft and hydrated and soothed too, they were very chapped but the relief was instant and long lasting too, something she hadn't had from any other lip balm she has tried. If you use lip balm or have very dry or chapped/sore lips, this is an excellent choice, it isn't too thick, feels lovely and hydrating on the lips and really helps with dry and sore lips and feels instantly soothing. It is also Gluten free, THC free and 100% Vegan. I have really enjoyed trying out both Hempz products and both are really lovely and do exactly what they claim, and I will definitely be looking into other Hempz products as after having a quick browse on their website I can see they have some great looking products that include, hair care, sun protection, false tan, body scrubs, oils, lotions and wash amongst many other great products, so definitely worth checking them out. If you would like to try the Lip Balm it is available on the parfumdreams website priced at £6.95 and the Coconut Fusion Shimmering Body Soufflé is also available from the parfumdreams website priced at £13.95. Have you tried any Hempz products? And if so what are your recommendations for me to try? Chat with me in the comments and let me know.